Dancers to celebrate the parish feast. The fundraising committee at the final party. 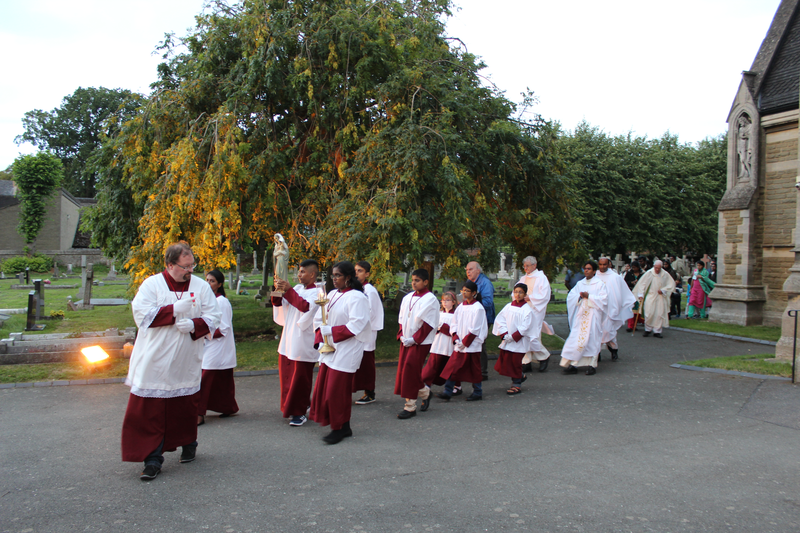 Splendid procession through the grounds of the church. 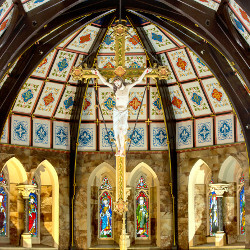 The church adorned with the new angels. 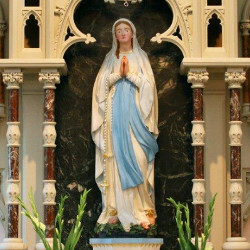 You can find full details of our Mass and Confession times here. We have also included the times of Eucharistic Adoration on this page should you need them. The most recent newsletter can be seen here. Should you have anything you wish to see included in the Newsletter, please contact the office on 01788 542 703. 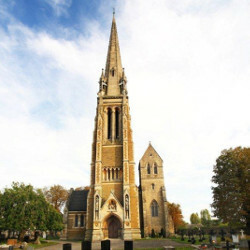 Find out how our church has evolved since the early 19th Century, from the original Pugin designed church through to the modern church that we see now.Read more. Eucharistic Adoration will close at 7pm on Monday 8th April and will resume on Monday 13th May. Divine Mercy Sunday the 28th at 3 pm. 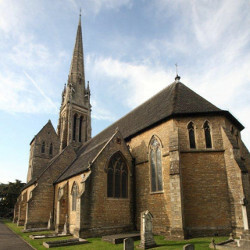 You have found St Marie's Catholic Church in Rugby. We are a forward looking church, though founded on traditional values. 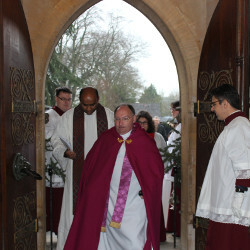 St Marie's is a vibrant welcoming community and personable in our approach. The parish is served by members of the Rosminian Community. We hope that you find the information contained in this website helpful. If not, or if you require further clarification, please contact us on 01788 542 703. New to the parish? please complete our registration form. 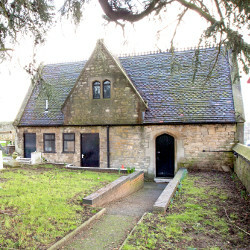 If you would like to keep up to date with St Marie's you can Click Here to see our Facebook page. The Church is celebrating an Extraordinary Jubilee Year which has, at its centre, the mercy of God. You are encouraged to take an active part in this celebration by reading the Jubilee Prayer. 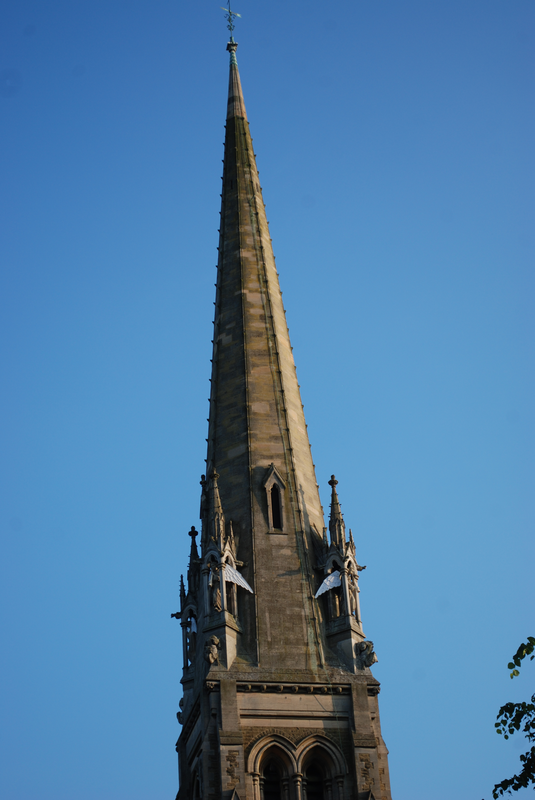 St Marie's Church needs £100,000 to restore our beautiful spire. You can help by donating through our Just Giving page here. St Marie's safeguarding officer is Margaret Nosowska. Please contact her in confidence on 01788 541 705 if you have any concerns.